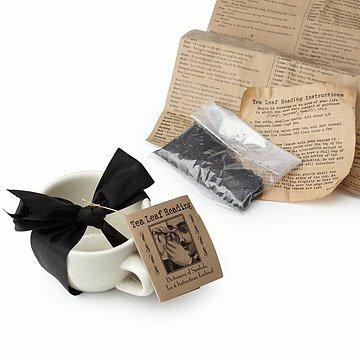 This tea leaf reading kit comes with instructions, a symbol dictionary, loose tea leaves, and a sturdy mug. Add a prophecy to your afternoon with the ancient Chinese tradition of tea leaf reading. Equipped with a history lesson, instructions and a dictionary of symbols, this set will intrigue any fan of history or mysticism. Brew these loose black tea leaves in the accompanying mug and read the signs. Cup made in China; kit made in USA. Check out the gift lab of the Tea Leaf Reading Kit on our blog! 1/4 cup of Chinese black tea included. It was the perfect gift! She loves things that are different and I didn't want to get her any of the usual stuff. Bought this for my Mom whom loves this kind of stuff. She said it was cute, fun, and came in a cute package. This product is used for giving tea leaf readings but also for developing your intuition. I bought this as a gift for someone and so I haven't tried it but it looks like a fun cute gift! Our older generation really could read tea leaves, and "talk off warts" and all the great things grandparents do. My friends grandmother told her, after ready her tea leaves, that within the month she would be leaving New York and moving to the South. My friend just laughed. But, low and behold, her husband and her moved to Beaufort, SC within 3 weeks. When she received this gift from me, she was so happy and it brought back such wonderful memories of her exotic grandmother. A wonderful gift for the "wonderful and wondering" new generation. My friend was so excited to receive this! It is a sturdy tea cup, with easy to understand instructions and meanings. The packaging was just as it looks in the picture. Awesome gift! I bought it as a unique gift for my sister, of course she is someone who is interested in this kind of thing, and loved it.